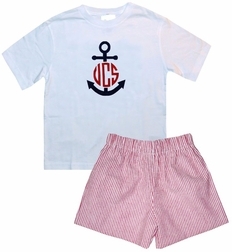 Caroline Bradlee Designs > BOYS > Boy's Monogram Anchor Custom Blue Seersucker John John or Shorts Set. A cute anchor monogram frame we just had to use! Here we have made a light blue striped seersucker fabric John John/romper or white shirt and red seersucker stripe shorts set for boys. 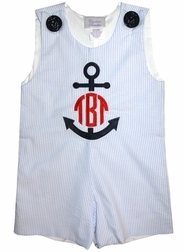 On the front, we have embroidered a big and bold navy anchor with a red monogram in the middle. Adorable for trips and vacations to the beach or any sunny area on or near the water. 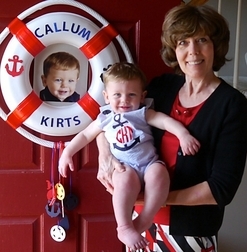 This little outfit is very popular here, and all the little boys love anchors, because we are on the Gulf of Mexico. To accentuate the anchor monogram on the John John, we searched high and low for navy buttons with anchors carved in them. And, we found them! Soooo, each shoulder strap fastens with a 1 inch round precious navy buttons emblazened with an anchor!